In this lesson, we will learn how to find the resultant of a system of two parallel coplanar forces having opposite directions. Two parallel forces have magnitudes of 24 N and 60 N as shown in the figure. 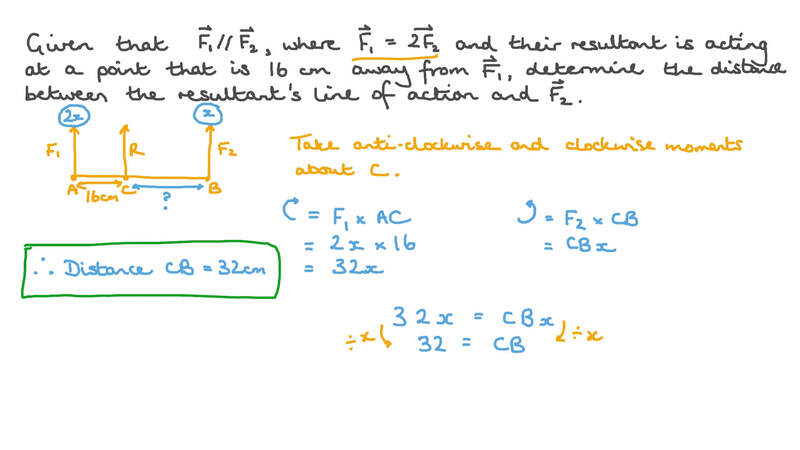 The distance between their lines of action is 90 cm. Given that the two forces are acting in opposite directions, determine their resultant 𝑅 and the distance 𝑥 between its line of action and point 𝐴 . Two parallel forces 𝐹  and 𝐹  are acting on two points 𝐴 and 𝐵 respectively, where the magnitude of 𝐹  is 5 newtons and 𝐴 𝐵 = 5 0 cm. Their resultant 𝑅 is acting on point 𝐶 , where 𝐶 ∉ 𝐴 𝐵 and 𝐴 𝐶 = 2 0 cm. If 𝐹  and 𝐹  are acting in opposite directions, find the magnitudes of 𝐹  and 𝑅 . 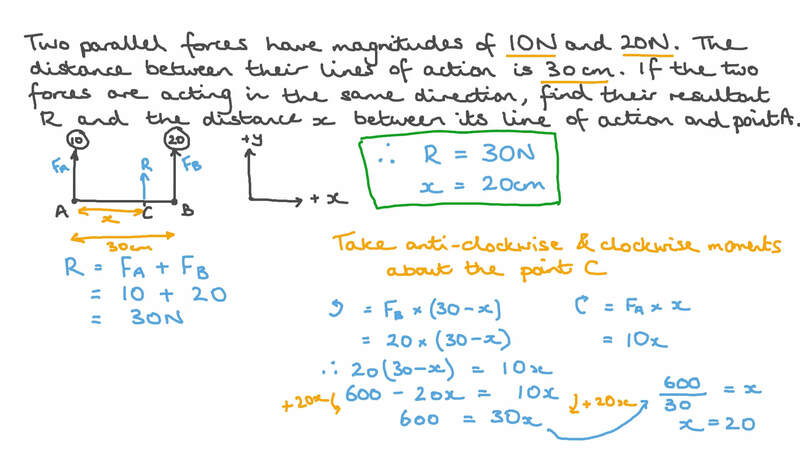 Two parallel forces have magnitudes of 10 N and 20 N. The distance between their lines of action is 30 cm. If the two forces are acting in the same direction, find their resultant 𝑅 and the distance 𝑥 between its line of action and point 𝐴 . In the figure below, 𝐹 1 and 𝐹 2 are two parallel forces measured in newtons, where 𝑅 their resultant. If 𝑅 = 3 0 N , 𝐴 𝐵 = 3 6 c m , and 𝐵 𝐶 = 2 4 c m , determine the magnitude of 𝐹 1 and 𝐹 2 . 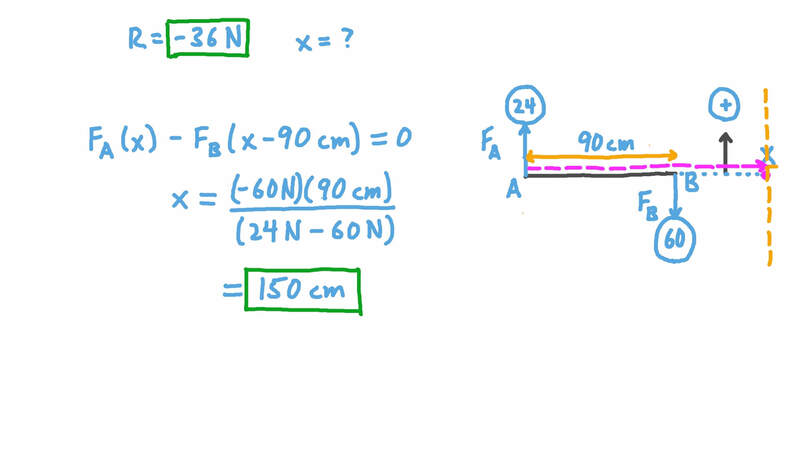 The given figure shows two parallel forces of magnitude N and 38 N and their resultant . If and , determine and the length of . A force of 31 newtons is acting on a point 𝐴 , while a parallel force of 𝐹 newtons is acting on a point 𝐵 . The magnitude of the resultant of these two forces is 73 newtons. If the 31-newton force and the resultant are acting in opposite directions, what is the value of 𝐹 ? The magnitude of the resultant of two parallel forces 𝐹 1 and 𝐹 2 equals 61 N. The magnitude of 𝐹 1 equals 112 N and the distance between 𝐹 1 and the line of action of the resultant is 17 cm. If 𝐹 1 and the resultant have opposite directions, find the magnitude of the second force 𝐹 2 and the distance between the lines of action of the forces 𝑙 , rounding this answer to two decimal places. Two parallel forces 𝐹  and 𝐹  are acting at two points 𝐴 and 𝐵 , and their resultant 𝑅 is acting at point 𝐶 , where 𝐶 ∉ 𝐴 𝐵 , the magnitude of 𝐹 = 9  newtons, 𝐴 𝐶 = 2 8 c m , and 𝐶 𝐵 = 1 6 c m . If 𝐹  and 𝐹  are in opposite directions, find the values of 𝐹  and 𝑅 .
𝐹  and 𝐹  are two parallel forces acting at the points 𝐴 and 𝐵 respectively, where 𝐴 𝐵 = 5 2 c m , and their resultant is acting at the point 𝐶 , where 𝐶 ∈ ⃖     ⃗ 𝐴 𝐵 . Given that 𝐵 𝐶 = 1 2 c m when the two forces are acting in the same direction, and their resultant is 28 N when they are acting in opposite directions, determine the magnitude of each of the two forces. Given that the two parallel forces ⃑ 𝐹 = 2 ⃑ 𝑖 + ⃑ 𝑗 1 and ⃑ 𝐹 = − 4 ⃑ 𝑖 − 2 ⃑ 𝑗 2 are acting at 𝐴 ( − 3 , − 5 ) and 𝐵 ( 5 , 3 ) respectively, determine their resultant ⃑ 𝑅 , and find its point of action. Given that ⃑ 𝐹 / / ⃑ 𝐹 1 2 , where  𝐹 = 2  𝐹 1 2 , and their resultant is acting at a point that is 16 cm away from ⃑ 𝐹 1 , determine the distance between the resultant’s line of action and ⃑ 𝐹 2 . 𝐹 and 12 N are two parallel forces, where 𝑅 is their resultant. Given that 𝐴 𝐵 = 7 2 c m and 𝐴 𝐶 = 4 8 c m , determine the magnitudes of 𝐹 and 𝑅 . Two parallel forces 𝐹 1 and 𝐹 2 have the same direction, and the distance between their lines of action is 90 cm. Given that the magnitude of their resultant is 49 N, and it is 60 cm away from 𝐹 2 , find the magnitudes of the two forces, rounding your answer to two decimal places. The magnitude of the resultant of two parallel forces 𝐹 1 and 𝐹 2 is 192 N, where the magnitude of 𝐹 1 is 64 N, and its line of action is 57 cm away from that of the resultant’s. If the two forces have the same direction, determine the magnitude of 𝐹 2 and the distance between the lines of action of the two forces 𝑙 .